Step away from the rosé—it’s time to try the chic new wine on the block. (Well, new to us, anyway.) 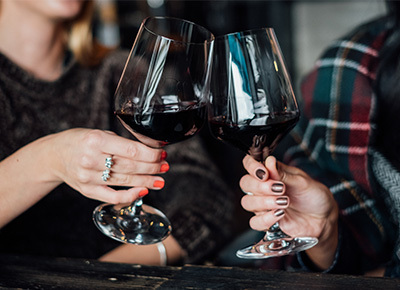 Black wine actually dates back thousands of years, but it’s making its way into American glasses just in time for sweater weather. To get the DL, we chatted with Kate Gersamia, who, with her husband, owns a vineyard in the country of Georgia, the birthplace of black wine. Wait, what the heck is black wine? Despite its nickname, it’s a red wine made from Saperavi grapes—but its color is such a rich, dark purple, that it looks black. Saperavi is Georgia’s most popular red wine, and the grapes are now being grown throughout the world, including the Finger Lakes region of the U.S., Australia and Eastern Europe. How is it made? Traditionally, black wine is fermented and aged in clay vessels called “qvevris” that are then buried underground, but some winemakers are now aging them in oak and experimenting with stainless steel. And what does it taste like? Gersamia describes Saperavi wines as elegant, with notes of juicy berry fruits, spice and a velvety texture. Basically, you’re looking at an easy-to-drink, balanced wine that just might become your new cold-weather go-to. RELATED: That Cool Blue Wine You’ve Seen All Over the Internet Is Finally Coming to the U.S.
Beaujolais Nouveau Rosé Is Trending, and Here’s Where You Can Buy It in the U.S. Cheers! Aldi’s Award-Winning Rosé Is Coming to the U.S. Shake Shack Now Has Prosecco Milk Shakes, Because Why Not?